For other people named Mike Barr, see Mike Barr (disambiguation). Mike W. Barr (born May 30, 1952) is an American writer of comic books, mystery novels, and science fiction novels. Barr's debut as a comics professional came in DC Comics' Detective Comics #444 (Dec. 1974-Jan. 1975), for which he wrote an eight-page back-up mystery feature starring the Elongated Man. Another Elongated Man story followed in Detective Comics #453 (Nov. 1975). He wrote text articles and editorial replies in letter columns for the next few years. By mid-1980 he was writing regularly for both DC and Marvel, including stories for Mystery in Space, Green Lantern, The Brave and the Bold, Marvel Team-Up, and a Spider-Man/Scarlet Witch team-up in Marvel Fanfare #6. Legion of Super-Heroes #277 (July 1981) saw him take on editorial duties at DC, a position he would hold until 1987. In December 1982, he and artist Brian Bolland began Camelot 3000, a 12 issue limited series that was one of DC Comics' first direct market projects. Barr and artist Trevor Von Eeden produced the first Green Arrow limited series in 1983. When the long running The Brave and the Bold series came to its conclusion with issue #200 (July 1983), it featured a preview of a new Batman series, Batman and the Outsiders by Barr and artist Jim Aparo, which would be described by DC Comics writer and executive Paul Levitz as being "a team series more fashionable to 1980s audiences." The Masters of Disaster were among the supervillains created by Barr and Aparo for the series. Barr wrote every issue of the original series, and its Baxter paper spinoff, The Outsiders that did not include Batman and introduced Looker. After the series' cancellation in February 1988, it was revived in November 1993 by Barr and artist Paul Pelletier. 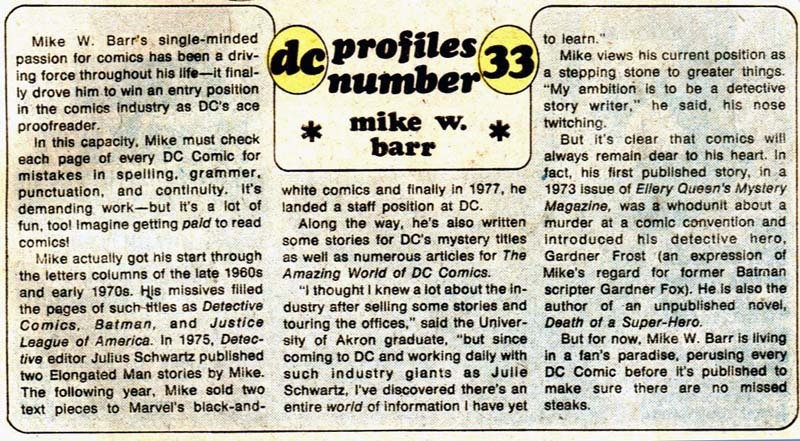 He was one of the contributors to the DC Challenge limited series in 1986 and wrote the "Batman: Year Two" storyline in Detective Comics #575-578 (June-Sept. 1987) which followed up on Frank Miller's "Batman: Year One". Barr introduced the Reaper in Detective Comics #575 (June 1987) and returned to the character in the Batman: Full Circle one-shot in 1991. Another project from 1987 was the Batman: Son of the Demon graphic novel which was drawn by Jerry Bingham, proceeds from which reputedly "restored DC Comics to first place in sales after fifteen years." This title, and Barr's work on Batman with artist Alan Davis have been cited by Grant Morrison as key inspirations for his own run on the Batman title. Barr's sequel, Batman: Bride of The Demon, was published in 1991. His other comics work includes Mantra for Malibu Comics and Maze Agency for Comico Comics and Innovation Publishing. Barr contributed to the Silver Age Sentinels anthologies of short stories from Guardians of Order. In 2007, he wrote a two-part story for the pages of DC's JLA: Classified (#47-48, Jan-Feb 2008), returned to the Outsiders with Outsiders: Five of a Kind — Katana/Shazam #1 (Oct. 2007), contributed to Tokyopop's Star Trek: The Manga, and relaunched Maze Agency at IDW Publishing. He has scripted many of Bongo Comics' The Simpsons titles, including a Christmas story for 2010. In May 2010, the Invisible College Press published Barr's science fiction/fantasy novel, Majician/51, about the discoveries of a scientist working at Area 51. Barr has written [for] every one of the first four incarnations of Star Trek: Star Trek, Star Trek: The Next Generation, Star Trek: Deep Space Nine and Star Trek: Voyager, in either comic book or other media. Barr's Batman stories and scripts have been adapted into several mediums, including for episodes of Batman: The Animated Series. ^ Manning "1980s" in Dolan, p. 201: "The Battling Bowman fought his way into his own four-issue miniseries at long last, thanks to writer Mike W. Barr and artist Trevor Von Eeden." ^ Manning "1980s" in Dolan, p. 202: "Despite being the final issue of this particular series, the book wasn't closed on Batman's team-ups. Although Batman was through working with partners, it was time to think bigger, and in a special sixteen-page preview insert written by Barr and with art by Jim Aparo, the Outsiders debuted. A super-hero team of Batman's own creation, the Outsiders would soon star alongside Batman in the new monthly series Batman and the Outsiders. ^ Levitz, Paul (2010). "The Bronze Age 1970-1984". 75 Years of DC Comics The Art of Modern Mythmaking. Cologne, Germany: Taschen America. p. 462. ISBN 978-3-8365-1981-6. ^ Trumbull, John (July 2014). "Watching the Detective (Comics)". Back Issue!. Raleigh, North Carolina: TwoMorrows Publishing (73): 50–58. ^ Manning "1980s" in Dougall, p. 155: The Outsiders #1 (Nov. 1985) "Written by Mike W. Barr and drawn by Jim Aparo, this issue debuted Looker in full costume." ^ Greenberger, Robert (August 2017). "It Sounded Like a Good Idea at the Time: A Look at the DC Challenge!". Back Issue!. Raleigh, North Carolina: TwoMorrows Publishing (98): 38–39. ^ Manning "1980s" in Dolan, p. 229: "In 'Year Two', a four-part sequel [to "Batman: Year One"] set in Batman's second year as a crime fighter, writer Mike W. Barr and artists Alan Davis and Todd McFarlane challenged the Caped Crusader with the threat of the Reaper." ^ Manning "1980s" in Dolan, p. 229: "In an over-sized hardcover graphic novel one-shot, writer Mike W. Barr and artist Jerry Bingham introduced a monumental new character into the life of the Dark Knight - Damian Wayne." ^ a b c "Mike W. Barr". FantasticFiction. 2012. Archived from the original on February 19, 2012. Retrieved February 20, 2012. ^ "Morrison in the Cave: Grant Morrison talks Batman". Newsarama. August 23, 2006. Archived from the original on October 12, 2007. Retrieved February 20, 2012. I was influenced by the animated series portrayal of Batman, by Christian Bale's definitive performance in Batman Begins and by Mike Barr's '80s Batman stories with Alan Davis, which swam bravely against the prevailing trends at a time when the grim 'n' gritty current was at its strongest. ^ Manning "1990s" in Dougall, p. 189: ""With art by Tom Grindberg, writer Mike W. Barr returned to chronicle a new Ra's al Ghul story in this sequel. ^ Appelcline, Shannon (2011). Designers & Dragons. Swindon, England: Mongoose Publishing. p. 337. ISBN 978-1-907702-58-7. ^ Barr, Mike W. (2010). Majician / 51. Invisible College Press, LLC. p. 246. ISBN 193146829X.